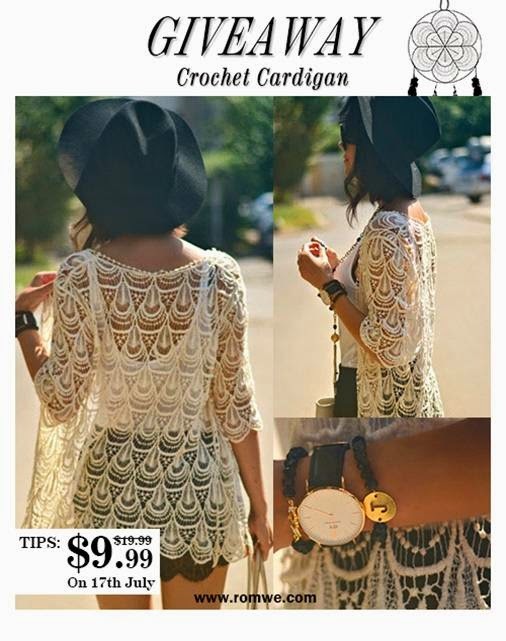 Where there's smoke, there's fire and this Romwe Lace Crochet Apricot Short-sleeved Cardigan is HOT! It is made by the decorative pattern of the dream catcher, and its flattering layer brings texture, color and style to any outfit. It just begs to be seen! Do you love it? 1. Like and share this post publicly. 2. Show some love and add a comment to the shorts at its product page. It is near the bottom of the page. As long as you have a Facebook account, you can comment. 3. Tell me you have done it by leaving me a comment following this post on my Facebook fan page and tag 2 friends! 4. Open worldwide & Free shipping! The giveaway will last for 7 days only! P.S. If u wanna buy this, it's for $9.99 only, 50% off, but for 24 hours on 17th July. Don't miss out! It's graceful, beautiful, unique and interesting. Not the kind of piece of clothing that you see everywhere. Also, I like that it can match any outfit for day and night.